Inspired by all the reports of community gardening around London, we have the urge to “green up” some neglected land. 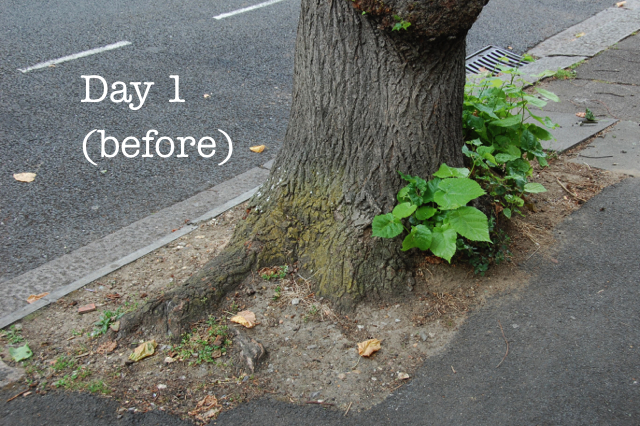 After a quick street survey, we decide to start with the tree pit outside our house. A bit of research on guerrilla gardening reveals that a key element to planting tree pits is to choose low value, tough plants as there is a reasonable probability they will get trampled, damaged or stolen. And even without all that, tree pits are not the most hospitable environments for little plants with poor, compacted soil and the competition of a mature tree for water and nutrients. We just happen to have a surplus of geraniums that have been sat around in trays for weeks so they seem like the ideal candidates. 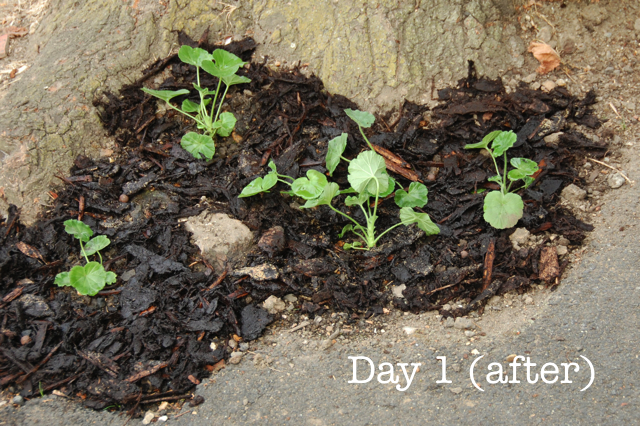 The biggest surprise in our guerrilla gardening experiment is just how bad the soil in the tree pit is. It might have been easier to break through concrete but we persevere despite some strange looks from passers-by. It’s fortunate that we chose plants with small rootballs because I don’t think we would have been able to chisel out holes any bigger. We add a bit of compost in a vain attempt to try and improve the soil, plant the geraniums and water copiously. We top with a bit of bark as a mulch and a sprinkle of wildflower seed balls. It all looks quite smart and we feel pleased with ourselves. We pop out every few days to water our new plants and several neighbours comment on how lovely it looks. It’s all going really well and we decide we might expand our guerrilla gardening horizons to something altogether more ambitious. 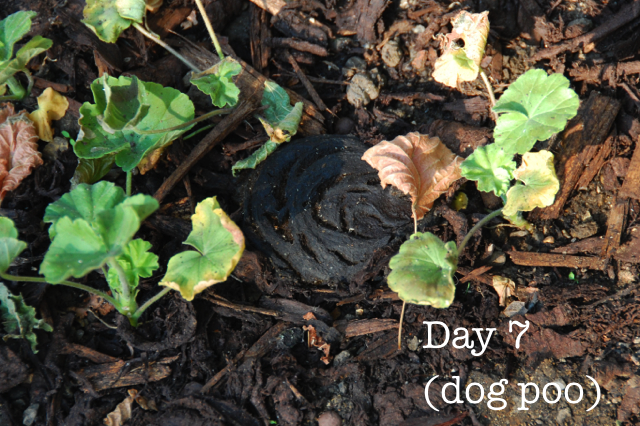 A week later we notice a large, sloppy circle of dog poo in the middle of the geraniums (sorry to be so graphic, hope you’re not eating). Cue lots of muttering about irresponsible dog owners. My husband suggests that it might provide a source of manure for the plants, “looking on the bright side”. Then a day later, on the other side of the tree pit, the bark has been removed. Completely removed, there isn’t a trace of bark left. And half of the plants are gone too. Seriously, what kind of person would do something like that? Someone worse than an irresponsible dog owner, that’s for sure. Now considering installing CCTV outside our house to catch the culprits should they decide to strike again. The seed balls have all disappeared with the bark too, so if you spot anyone around London with a small amount of bark that suddenly starts sprouting wildflowers, do let us know. Categories: experiments, lifestyle, projects | Tags: community gardening, family gardening, gardening with older children, guerrilla gardening | Permalink. Day 3 of the school summer holidays and I’ve already had the urge to retreat to a darkened room and sob quietly. But you’ll be pleased to hear that I managed to pull myself together and we spent the afternoon doing something much more constructive; making garden notebooks. The inspiration for this came from our big summer project – decluttering the house. We’ve lived here for 19 years and we’re a family of hoarders, so a huge clear out is long overdue. Yesterday’s cupboard revealed all sorts of lovely letters written by my daughters when they were much younger, back in a time when it was completely normal for them to write me notes telling me that they loved me. No surprise that they’re hugely embarrassed by this now. And I’d forgotten that I’d gone through a phase of buying them notebooks for various holidays and getting them to write/draw holiday diaries. We spent ages reading through those and we still haven’t quite finished clearing that cupboard out. That sparked the idea of making some garden notebooks to record all of the gardening we’ll be doing over the coming weeks. We made our notebooks from some white card and printer paper, bound together with garden twine and an embroidery needle. If you don’t feel like decorating your own notebook you could download this beautifully illustrated garden notebook cover instead. And finally, my favourite letter from our trip down memory lane was from my eldest daughter and it went along the lines of: “Dear Mummy, I am very sorry for the pretend kick. It won’t happen again. I am so very sorry. PS Could I have a banana please?”. 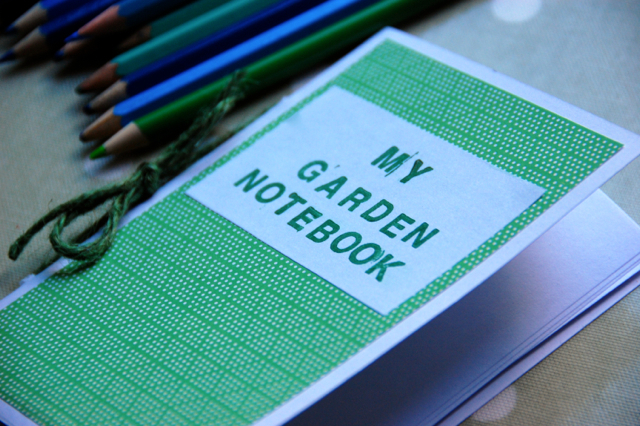 Categories: projects | Tags: family gardening, garden notebook, gardening with children | Permalink. 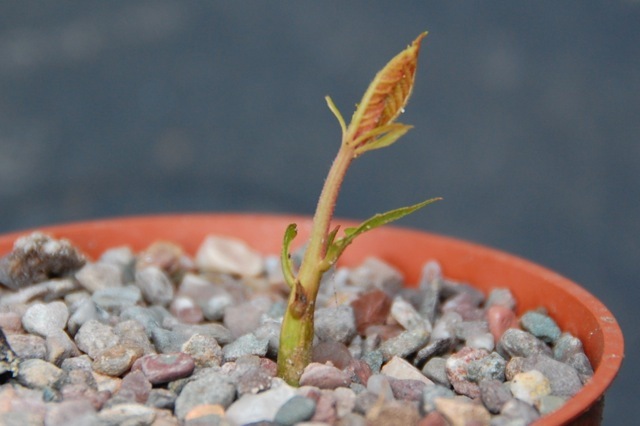 A quick update on the tree seeds that we planted last Autumn, left outside and then forgot about. So far, all but one pot is showing signs of germination so the sink or swim test seemed to work. 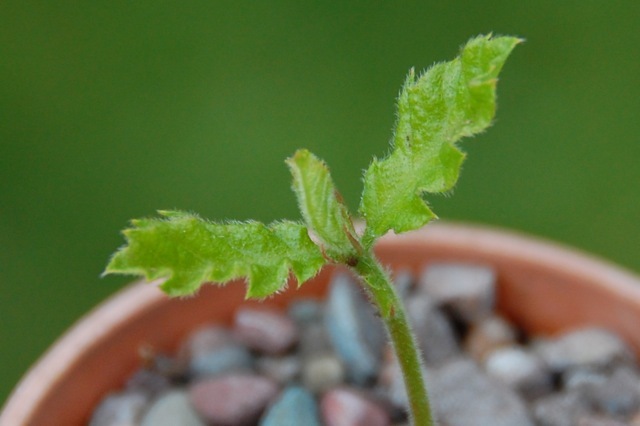 Above is a seedling of the Turkey oak (Quercus cerris). Although I have a strong suspicion these may be the result of weed seeds that have been carried by the wind…. Categories: projects | Tags: gardening with children, growing trees, planting acorns, tree seedlings | Permalink. It’s a high risk strategy, I know. My arms are still tingling as I write, so bare arms aren’t recommended. But if you have a patch of young nettles nearby, you can make a brilliant liquid plant food for free. anything that is looking a bit sad and yellow but should really be green and happy. Also, given the huge amounts of rain we’ve had over the last few months and its associated nutrient leaching, plants and garden soils may be in need of a bit of TLC. 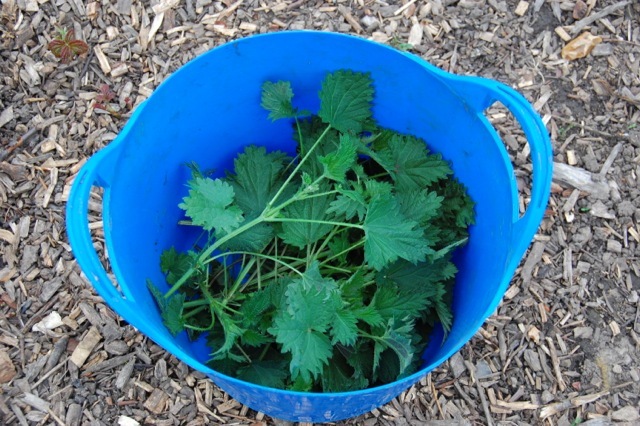 Apart from trying hard to avoid being stung, nettle fertiliser couldn’t be easier to make. Step 2 Cover with water. Some people suggest weighing down the nettles with a brick but this is a refinement I don’t bother with. Step 4 Allow a child to stir vigorously with a large stick whilst the fertiliser is maturing. This bruises the leaves and helps the process along. 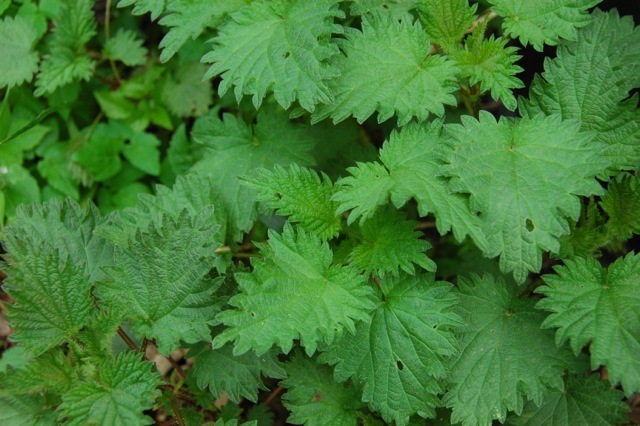 Most “recipes’ for nettle fertiliser suggest bruising the fresh leaves before immersing in water. But I know from bitter experience that’s a stinging disaster waiting to happen. 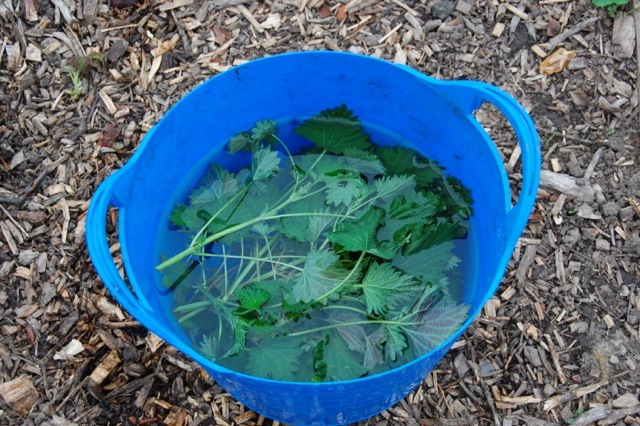 Step 5 Pour off the liquid into another bucket and put the discarded nettles on the compost heap. The fertiliser will be strong (as evidenced by the smell!) so it’ll need to be diluted – the rough guide is 1 part fertiliser to 10 parts water. Use the diluted fertiliser to water plants in need of a boost. A bit later in the season we’ll switch to comfrey fertiliser. Made in exactly the same way, this has higher levels of potassium which is good for flower and fruit development. Categories: education, grow your own, projects | Tags: family gardening, gardening with children, grow your own, nettle fertiliser | Permalink. A week to go until Mother’s Day. If you’ve been highly organised and already have a gift purchased/ordered then you can stop reading now. 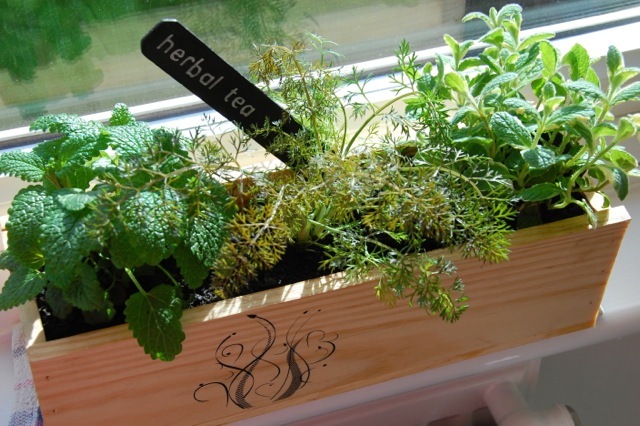 If not, here’s a little idea for a simple but effective handmade Mother’s Day gift that children can help with: a grow your own herbal tea planter. We used a recycled wine box and 3 small plants but any pot or window box planter would work, just adjust the number of plants accordingly. If your planter doesn’t have drainage holes in the base, these need to be added – I drilled some holes in the base of the wine box. I also lined the box with some old compost bags as I know from experience that wooden planters can start to rot in no time at all. If you do this, don’t forget to snip some drainage holes in the compost bag. Then onto the plants. There are lots of choices for herbal tea but we narrowed our wish-list down to five. 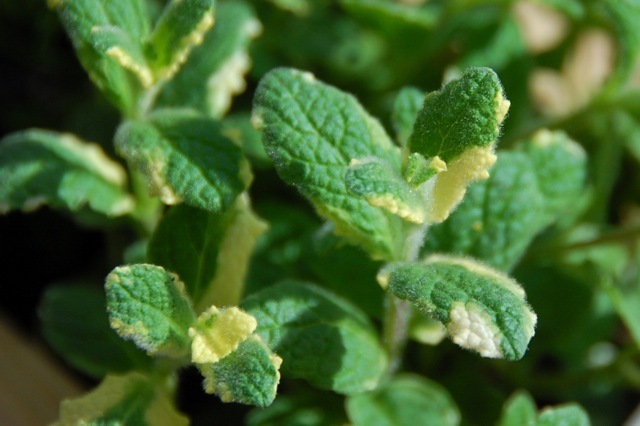 Many types of mint are good for herbal tea – Moroccan mint has a particularly good flavour – but we selected apple mint for its attractive variegated leaves (see photo above). Makes a good herbal tea on its own and is often used as a base for adding other flavours. As the name suggests, this has a licorice flavour, and as an added bonus the blue flowers are attractive to bees. Another licorice flavoured herb with attractive feathery leaves. With fennel the seeds, rather than the leaves, are collected for making tea. On a quick trip to the garden centre we managed to find small plants for three of our wish-list; lemon balm, apple mint and bronze fennel. 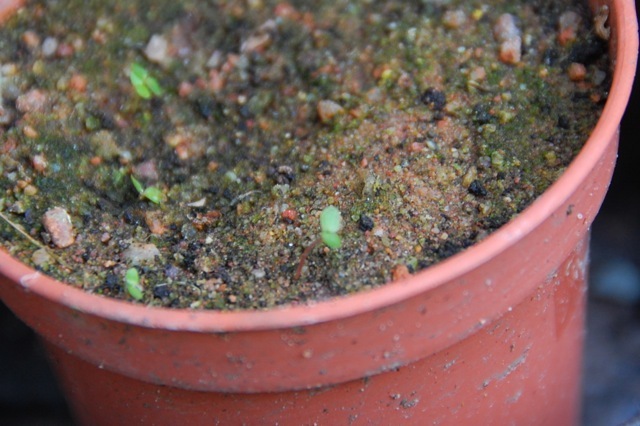 I later found some seeds for anise hyssop in my seed collection so a small pot of those are in the propagator as we speak. And the chamomile will have to wait for the moment. All of these herbs will be happy in a sunny spot and will need to be watered frequently as the container is relatively small and the compost likely to dry out. I suspect that we’ll replant them directly into the ground in the garden or allotment at some future point but for now they’re looking pretty on a patio table in the sun. The mint, of course, will have to stay in a pot otherwise it’ll take over the whole garden. When I’m ready for a cup of tea I’ll harvest about 2 tablespoons of leaves, bruise them gently to release the aromatic oils and then steep in hot water for up to 5 minutes. Trial and error may mean this “recipe” gets adjusted over time. Categories: containers and pots, grow your own, projects | Tags: anise hyssop, apple mint, bronze fennel, gardening gifts, gardening with children, german chamomile, grow your own herbal tea, lemon balm | Permalink. 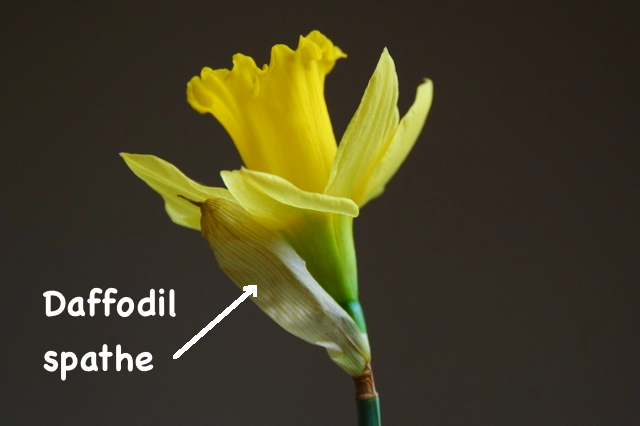 Have you ever …… dissected a daffodil? Pulling flowers apart is the sort of behaviour that’s usually frowned upon. But this time it’s for a good cause; learning a little bit about flower anatomy. You don’t need to sacrifice a daffodil in its prime either, one slightly past its best works just fine. And there are no tools required apart from your own hands – we managed to tear this flower apart without scissors or knives. Rip the corona lengthways then peel it away from the flower stem. A little bit of pollen may be released as you do this. 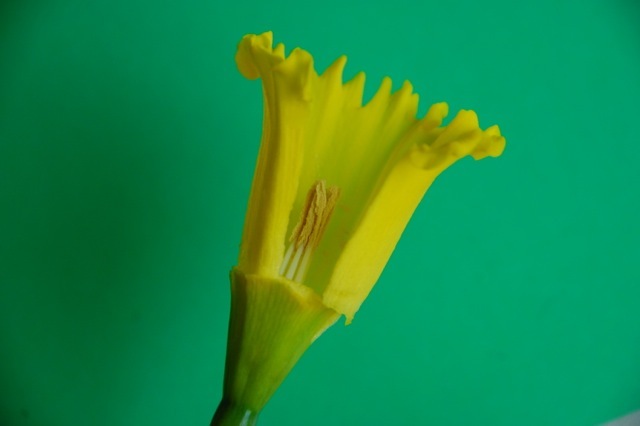 Then you can remove six stamens (the male part of the flower’s reproductive system). 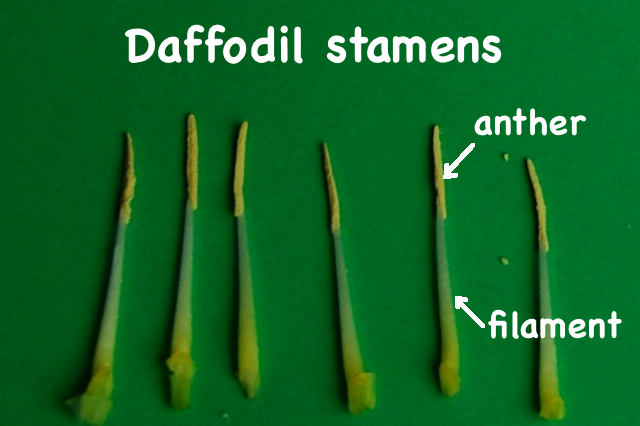 Each stamen consists of an anther which contains the pollen grains, supported by a stalk called a filament. 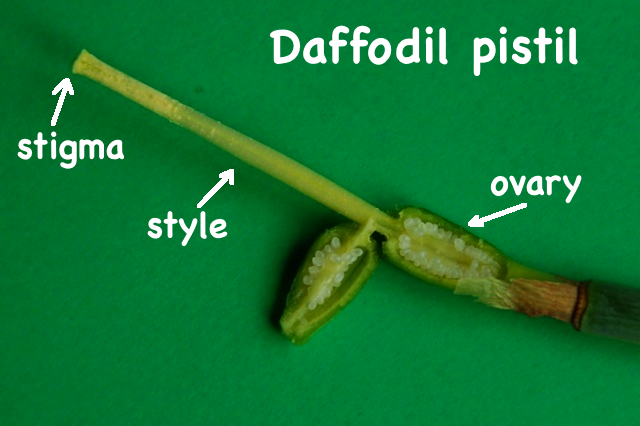 This should leave you with the female reproductive parts; collectively known as the pistil (or carpel). 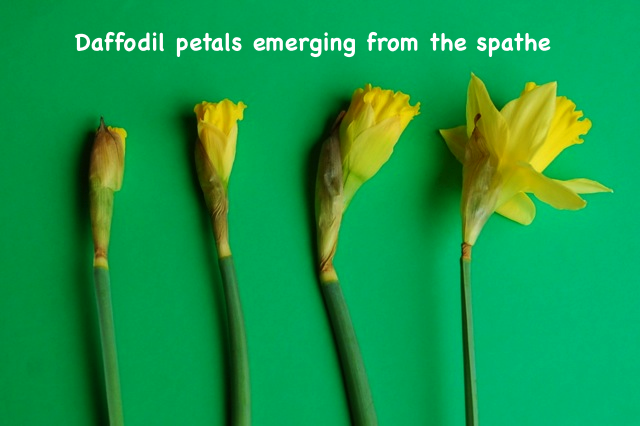 The stigma receives the pollen and a pollen tube grows down the style so that the ovules (egg cells) inside the ovary can be fertilised. It’s fairly easy to use a thumbnail to prise the ovary apart, as in the picture above. 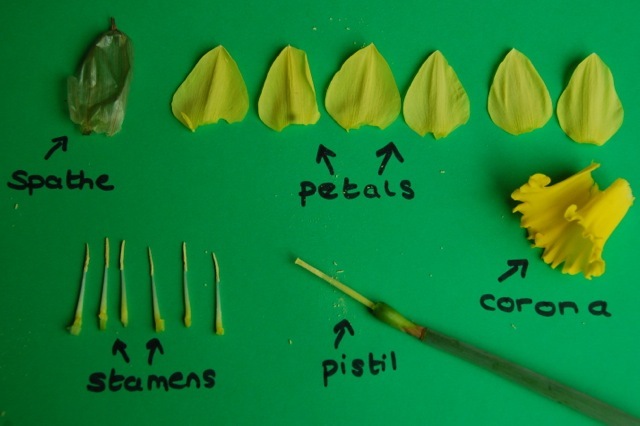 If all that has whetted your appetite, this link has a comprehensive summary of the structure and function of flowers. 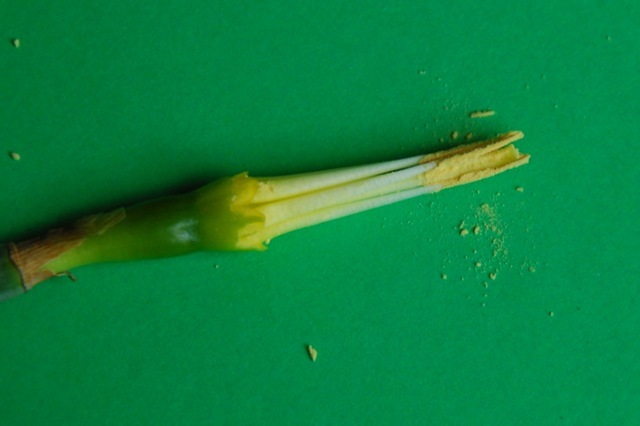 And one final note, always supervise children when dissecting daffodil flowers. 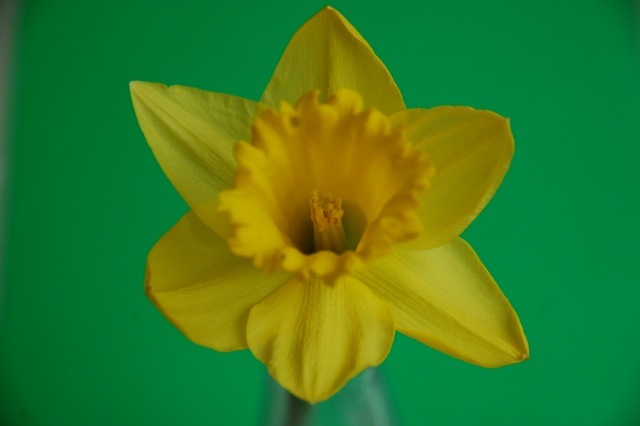 Although the daffodil is a common flower, all parts of the plant can cause illness if eaten. Categories: education, experiments, flowers, projects | Tags: children, daffodil dissecting, family, gardening with children | Permalink. My younger daughter has a fixation with digging holes at the moment. So before she turns the allotment into a lunar landscape with deep craters everywhere, I thought we’d channel her enthusiasm into something productive. 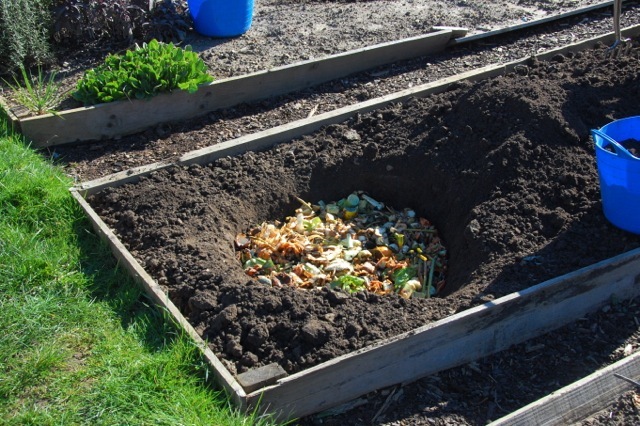 I’ve been meaning to try trench composting for a while, partly because it sounds a lot simpler than other composting methods. 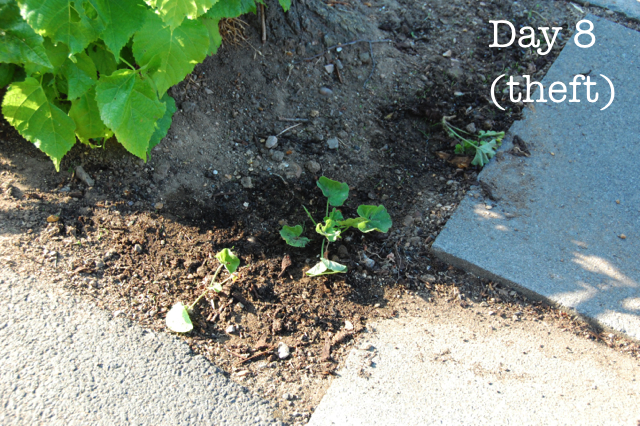 Essentially you dig a hole, bury some kitchen scraps, cover them with soil and wait. And that’s it. No turning the compost heap, no watering if it dries out, and no need to move the finished compost from the heap to the growing area. We collected vegetable peelings and uncooked food waste for a week and popped them in a hole that was supposed to be about 30cm deep, but I suspect was nearer 20cm. We went for a circle instead of a rectangular trench as we plan to plant a wigwam of climbing beans on the site a little later this season. I’ve read that you can add cooked food waste to a trench composting system but I can’t help thinking that would be an open invitation to all the foxes in the neighbourhood. I have no idea how long the composting process will take although some people report a noticeable breakdown of the trench contents in just a couple of weeks. The process is anaerobic (i.e. not using oxygen) compared to aerobic decomposition in the more usual compost heap – hence the reason regular compost heaps need to be turned when composting slows down; to add more oxygen. If it works, this could be a great composting approach for the allotment which has lots of bare soil for several months of the year and hungry crops to support. We’ll dig down again in a few weeks to assess what’s happening and report back. Categories: experiments, grow your own, projects | Tags: allotment, children, composting, trench composting | Permalink.